Yet another AMAZING spinoff on Chinese dumplings...and filled with healthy and super tasty veggies! And because there's only veggies in these, you won't get full quickly...and yes, you will want to eat the whole batch! A mixture of snow peas, mustard greens, garlic, and green onions is sauteed in black bean sauce, soy sauce, and honey: this creates an extraordinarily flavored combination of sweet and bitter, and pungent and salty. And these are anything but bland! This mixture is good enough to eat on its own, as a nice side dish to complement an Asian meal. Of course, the preparation of the dumplings is rather time consuming and messy, but the end result is so worth it. Simply fill a skin, fold over and seal with egg wash, and steam in an oil-sprayed basket (the oil is necessary to prevent sticking). 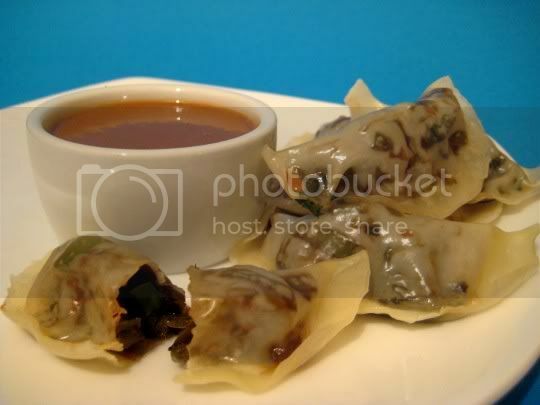 The greens provide a nice crunch, while the wonton skins create a chewy texture. You can pop these in your mouth one by one, and before you know it, they'll all be gone! Perhaps even better, is the rich dipping sauce the dumplings are served with: vegetable broth, fresh grated ginger, honey, soy sauce, peanut butter, and tahini. The tahini gives the sauce sort of a chalky texture, but the richness of flavor it provides is so good. It's peanutty, smoky, sweet, and tangy...almost seeming to have a hand in Thai cuisine. Make again? Definitely. And I'll definitely have to try the dumplings mixture alongside some teriyaki tofu and steamed jasmine rice...yum!